This risk has implications for the LTC provider ranging from lost work days, at the low end, to suits brought about as a result of injury to staff or patient. This risk can be reduced, and staff morale improved, through the utilization of “assistive” patient handling devices suac as electric beds, lifts and trapezes. 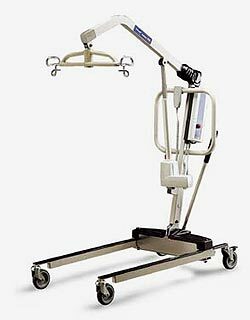 MedSTAR has a variety of vendor offerings in this area, including the Invacare IVC Electric bed, Reliant Plus Lift and Floor Standing Trapeze. Click on a Selection Below for Further Information on Patient Positioning and Handling. Electronic system includes two 24-volt batteries: one for lift, one for battery-charging station; a manual emergency lowering device, and anti-entrapment if boom meets any resistance while lowering. Height range allows lifting from floor and high surfaces. Removable battery pack eliminates downtime and simplifies the charging process. Safety-tested for highest quality standards. 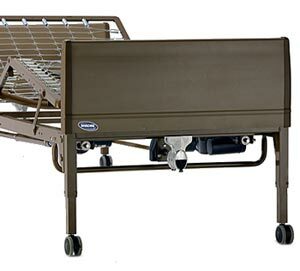 Base legs adjust easily and lock securely into open position with the padded shifter handle.Total pinch-point protection covers all moving parts for added safety. 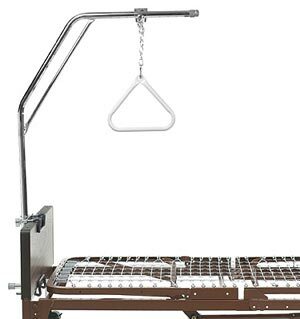 Padded swivel bar with 360 degrees rotation and six-point hookup allows use of Invacare chain-free slings as well as older-style slings with chains or straps. Covered base provides protection against wear, dirtand moisture.